This is just a follow-up to my previous post on this topic. I've continued to monitor this and it is working fine. 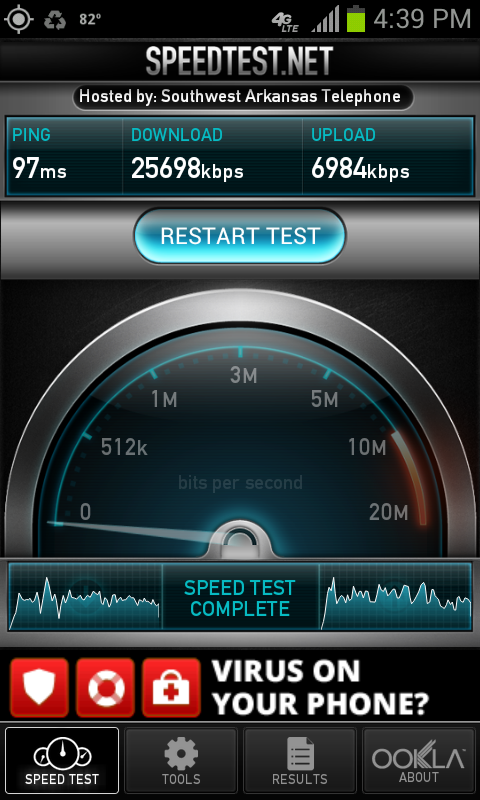 I bumped my uplink speed to 400 Kbps for an extra 50 Kbps. Recently I've been doing some big uploads to Youtube. The data is going across my LAN from a PC to the router and then across the WAN from the router to the Internet. Ok, I'm a big Google user. I switched to keeping my bookmarks to Google Bookmarks with AddThis to add bookmarks. 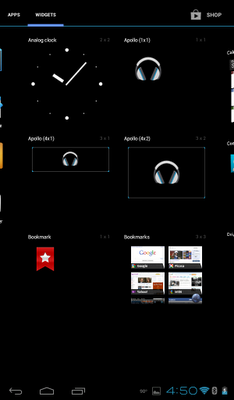 While AddThis works well, Google Bookmarks isn't integrated into Chrome so Chrome's bookmarks are totally separate. I'd had Xmarks on my To Do list for a year or more. I made a run at it recently. I installed Xmarks on my Chrome browsers and my wife's Firefox. On a single account I established 2 profiles, one for me and one for my wife. Then I made the appropriate profile the default for each browser instance. Then I imported the Google Bookmarks into my profile and my wife's Firefox bookmarks into her profile. So far so good. All seemed well for a couple of days until I noticed that my Chrome bookmarks had many copies of the "Google Bookmarks" folder. It seems that Chrome's Sync settings were replicating Xmarks syncing. So I needed to uncheck "Bookmarks." But now my wife was complaining. It seems that when the Firefox Add-On was syncing to Xmarks the entire instance of Firefox would freeze. That raised the old adage of "When momma ain't happy, ain't nobody happy." Xmarks is now uninstalled on all browsers. 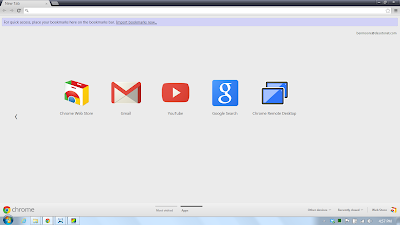 As an interim I am trying using Chrome's Bookmark Bar to access Google Bookmarks. 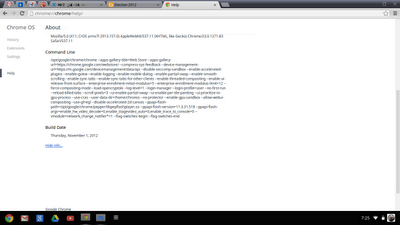 First I went to http://bookmarks.google.com and bookmarked that in Chrome. Then I went to http://support.google.com/chrome/bin/answer.py?hl=en&answer=100215 and dragged that bookmarklet to the Chrome Bookmark Bar. 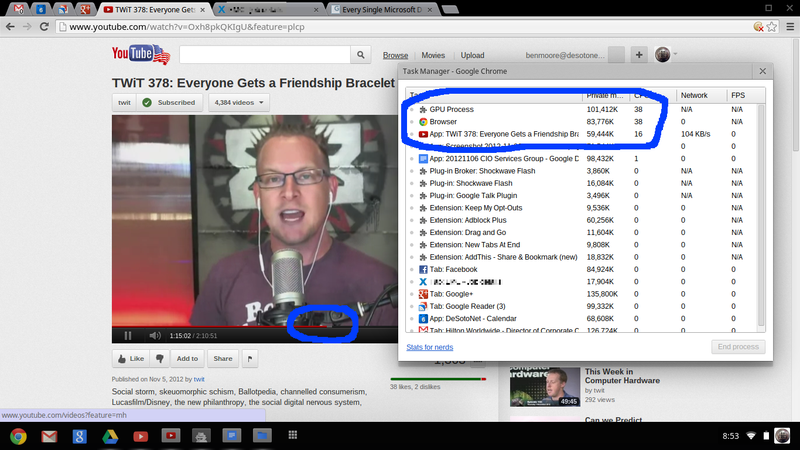 Then for clarity I renamed those 2 items to "See Google Bookmarks" and "Add Google Bookmark" respectively. That is a kludge and doesn't do anything for Firefox. I may try to make a run at Xmarks again. I tried. I really did. But I returned the Chromebook. It was a lot of little things. The SD card stuck out of the SD slot, the hinge was ugly, the keyboard mapping was odd, the touchpad was numb, overall it was slow, the updates to Chrome OS were behind, the Chrome extensions were backlevel, yada yada. Besides the sluggishness in YouTube it was also slow updating Google Docs. I have a large Google Document that updates on the T420s in seconds. It updates on the X40 almost as quick but on the Chromebook it consistently took 20 seconds to update. The price was great but the function was unsatisfactory. I've just moved into the 21 century with my video recording. Way back when (2004) I built a PVR using SageTV. I took it through several versions of software and hardware. The hardware (Dell GX270) is now so old. In early 2012 the UPS died and the fan got real loud. I used the excuse of the UPS dying to just turn it off. Most of my usage at that time was to record analog TV shows and burn them to DVDs for my granddaughter. The quality was fine for her. I had moved to TiVo for my HD TV timeshifting but I hadn't tried to burn that content to DVDs. This past weekend there was a football game that I wanted to keep. I fired up the old SageTV and recorded it there as well as on the TiVo. I did my normal process using the SageTV copy and burned a DVD. It looked awful on my 52" Sony. Back to the drawing board. I downloaded TiVo Desktop and installed it. Go into TiVo Desktop, click File / Preferences and uncheck the box that says "Use fastest method available..." Then I moved the recording from the TiVo to my desktop. It was huge! 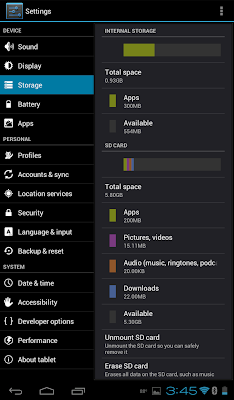 31GB for 4 hours. But now what could I do with it? The file type was .tivo. After a fruitless session of Googling I just tried renaming it to a .mpg. Doh! Then VidoeRedo Plus could open it and operate on it. I used VideoRedo to edit out the commercials and then truncate it to the end of the game. That got the file down to 21GB. Then I took it over to Ulead DVD Movie Factory 6. After fiddling around a little I convinced DMF to create 16x9 output and to use a double layer DVD. It worked pretty good for a first attempt. There were some compression artifacts in the high activity shots but I think there are some settings that I can change to improve this in the future. Remember that the TiVo file is 1280x720 and the DVD in 16x9 is only 720x405 so DMF has to transcode the video. By the way, while I haven't exercised the TiVo movement exhaustively I haven't encountered any programs that are copy protected. This may prompt me to move to Blu-ray! 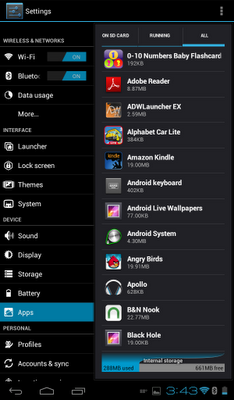 A while back I mentioned a couple of Cloud apps that I use. Although I'm a huge Google user, I've been using Dropbox for even longer than Google Docs/Drive. And I've found that the app ecosystem around Dropbox is a lot more mature than around Google Drive. I started off just trying to find way to maintain a To Do list that I could access from anywhere. 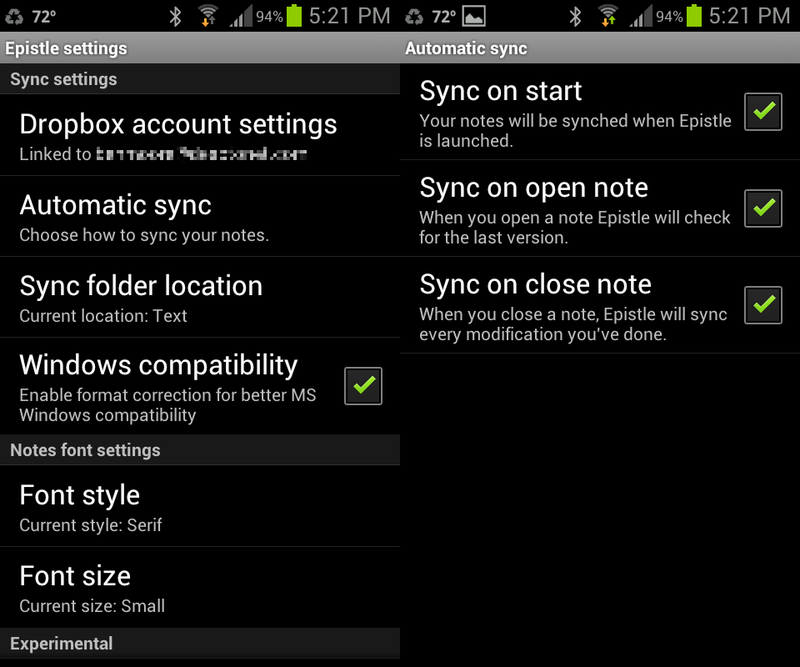 I came across Epistle, an Android app, that lets you edit a text file from Dropbox on your Android device. 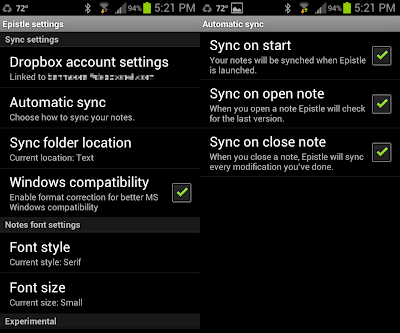 Obviously then you can edit the text files from your PC using Notepad or Writepad. So my issue with To Do list was done. That worked so well I began looking for how how I could leverage that solution. My wife and I are always making grocery lists on scraps of paper and then leaving them at home when we drive by the grocery store. But my wife uses an iPhone. One thing I don't like about iOS apps is that there are so many fewer free apps. 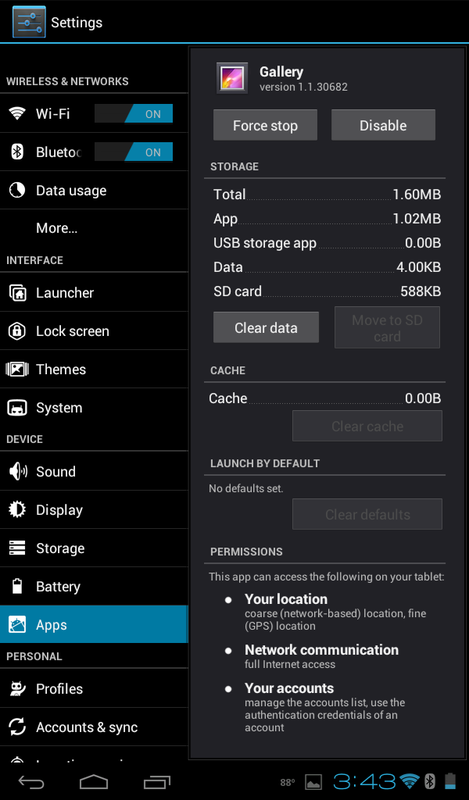 It's not that I mind paying for apps, it's just that simple function should be simple cost, maybe even free. After looking at a number of iOS apps that allow editing of Dropbox text files, I settled on Nebulous Notes Lite. As you'd guess from the "Lite" moniker, there's a paid version that eliminates the ads but it costs $5. Way too much. My wife loves it. She'll update the grocery list and text me to stop by the grocery store and I've got a complete list. I got a new Google Chromebook. No Notepad there. Sure I could download a file from Dropbox, edit it using Google Docs, and reupload it to Dropbox but that wasn't cool. So I Googled it some and found Writebox. It does the same thing as Epistle and Nebulous Notes but from a browser. Perfect for the Chromebook. 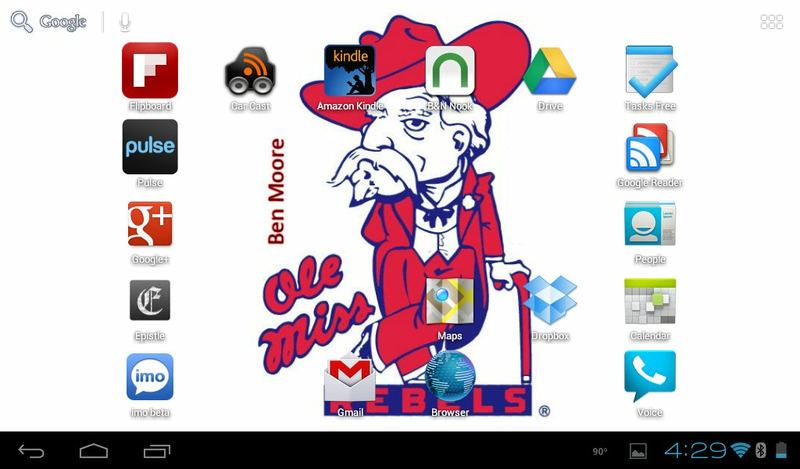 And there's even a Chrome app if you want it more integrated. Writebox doesn't have an automatic sync option like Epistle and Nebulous Notes so you have to press Ctrl+S when you're done. In my original post about my Chromebook I expressed some concerns. These haven't been assuaged. 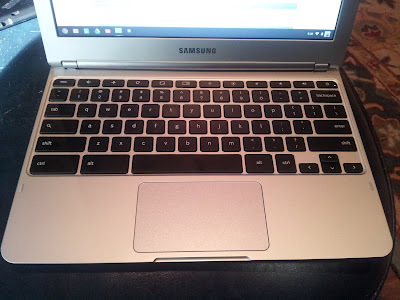 This week I took the Chromebook into the "wild." I took it to work. As I waited for the meeting to start I started watching a youtube video. Occasionally I would switch to another tab and perform another task, e.g. checking my mail. When I did, the audio got choppy. 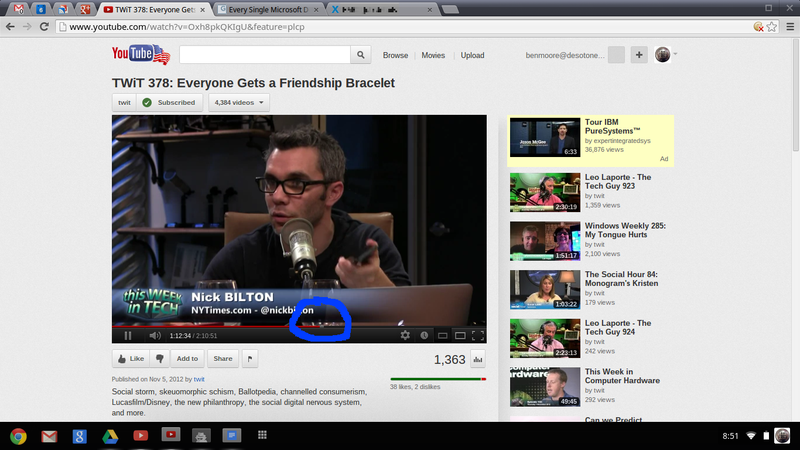 The youtube progress indicators were right on top of each other. The red line is the current position and the gray line is the progress of the download. Hmmm. 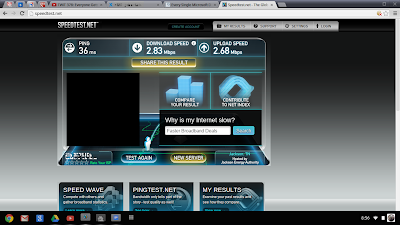 Must be that the facility's bandwidth was marginal. Nope. What could it be? Processor? Bingo! Incredible. 92% of a processor (remember it's dual-core) was being used to render the youtube video. So I come home and begin to read my RSS feeds. Up near the top was Brian Kreb's post on yet another Flash update. 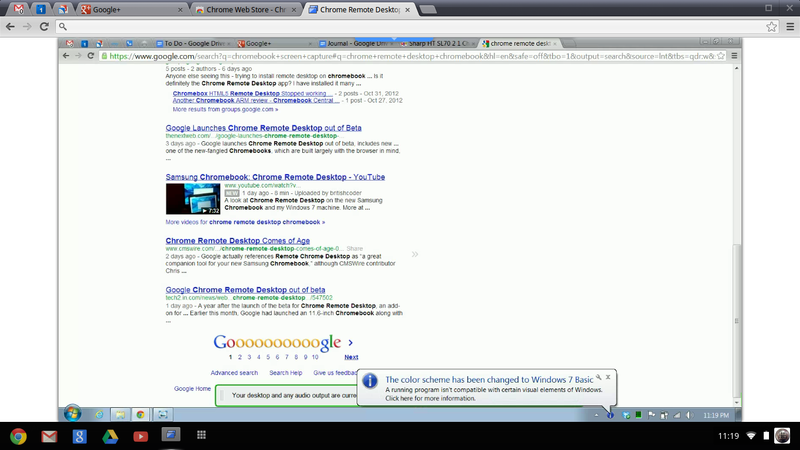 Chrome browser on Windows 7 is prompting me to update it to v23.0.1271.64 m.
So I go over to the Chromebook. No prompt to update but maybe it's so slick it did it in the background. Sorry Charlie. Build Date: Thursday, November 1, 2012. Specifically the Flash plugin is 11.5.31.2 on Chrome browser on Windows 7 and 11.3.31.518 on the Chromebook even a day later. ChromeOS updated yesterday to a November 6 build (why did it take 4 days?) but it still had Flash 11.3.31.518. And not a word on the Chrome Blog. On the day the new Samsung Chromebook was announced, I pre-ordered one from BestBuy. Long story why but it arrived last Thursday. My wife has used it as much as I have and she loves it. She likes it because it is light and cool. She normally uses a ThinkPad T61. Me, I'm a little more objective. Since it only has a 16GB SSD I ordered a 32GB SD card to supplement it. The SD slot in my T420 lets the card go completely inside the chassis so I just assumed that's what the Chromebook would do also. Wrong. The picture on the left is of the empty slot and on the right the card is inserted. You can see that the card protrudes about 3/8". You can't practically leave it in there as you'll break it off. Grumble, grumble. 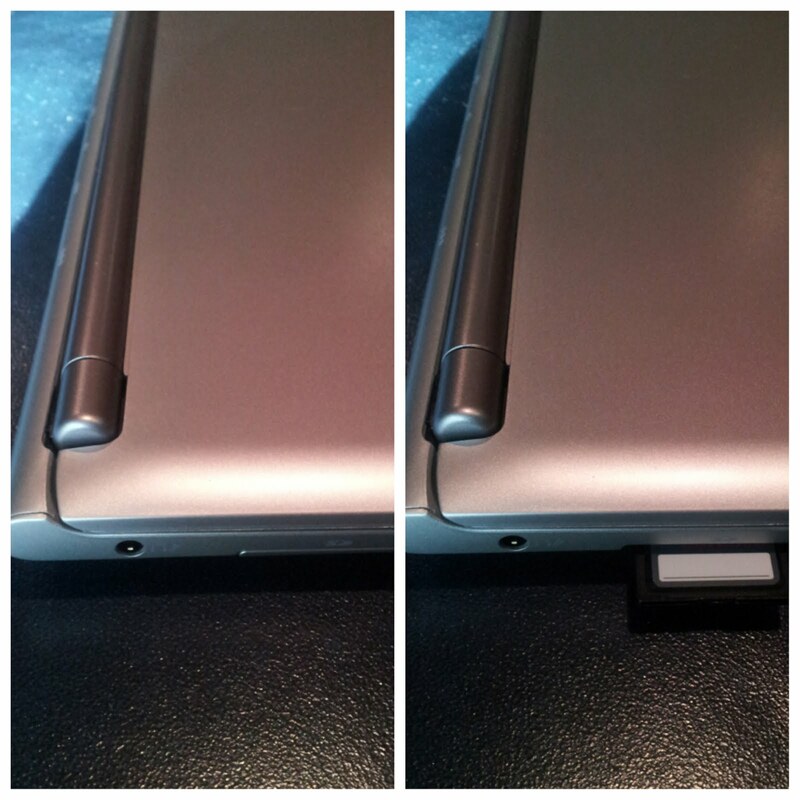 Also notice how the screen hinge sticks up noticeably. I know it only costs $249 but that's UGLY. 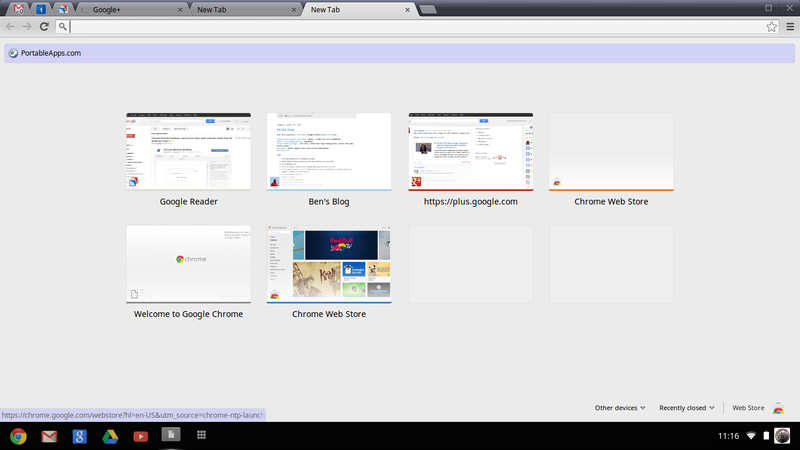 The browser on Chrome OS isn't the same as the Chrome Browser on Windows. For example, I use the Chrome Toolbox. 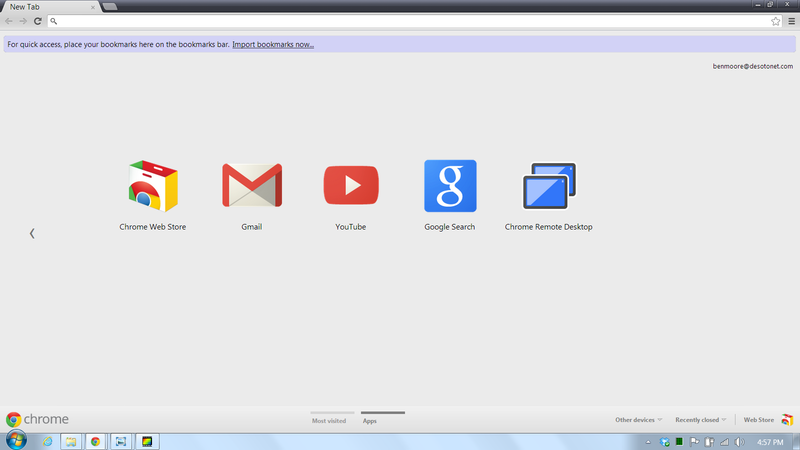 Here's the Chrome Toolbox v1.0.32 Options screen on Chrome 22.0.1229.94 m on Windows 7. 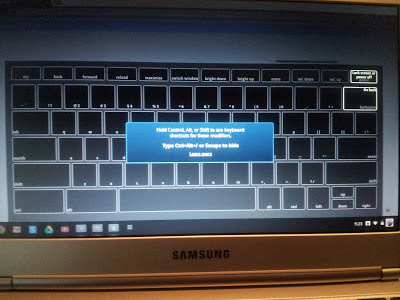 And here's the Chrome Toolbox v1.0.32 Options screen on Chrome OS 23.0.1271.49. "Double click on a tab to close it" is why I use this extension. 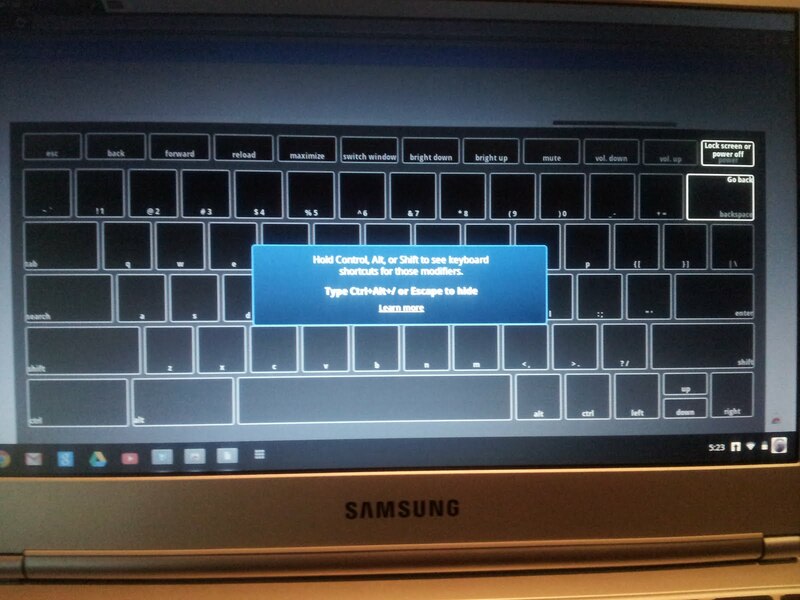 No, that's not an option on the Chromebook. 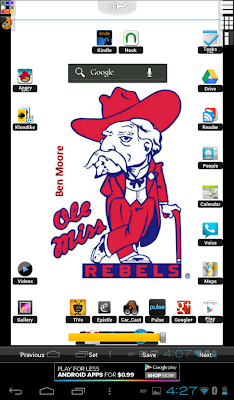 I've just begun to play with Chrome Remote Desktop. 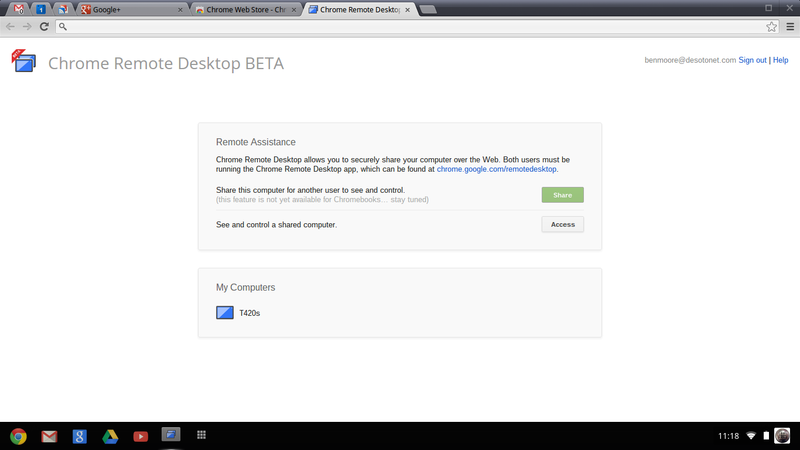 On Chrome on Windows it is v1.9.1271.42, On the Chromebook it is v1.8.1229.66 and still labeled "BETA". 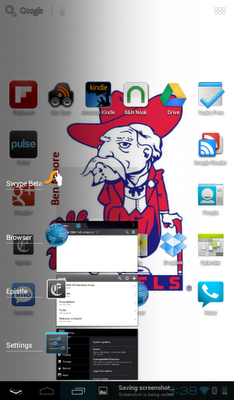 On Chrome on Windows the Chrome Remote Desktop is an icon on the new tab screen. Not so on the Chromebook. 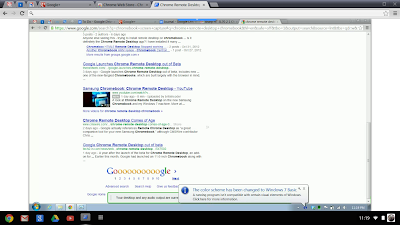 So how do you invoke Chrome Remote Desktop? 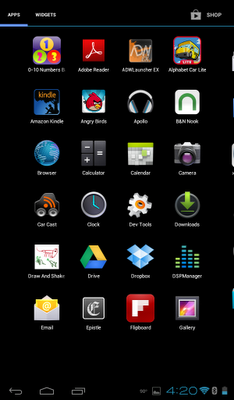 Chrome Remote Desktop is the last icon in the app list. From there on, it works fine. 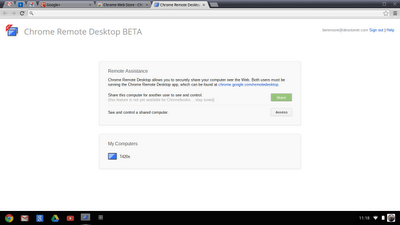 Stay tuned for more discussion of Chrome Remote Desktop. Now a Chromebook lives and dies by the Cloud. So you'd expect the interaction with cloud services would be exemplary? Don't get your hopes up. 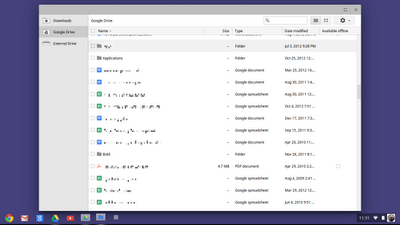 Ctrl+M (more on that keystroke combo in a little) brings up the Chromebook's File Manager. Yeah, that's not what I was expecting either. 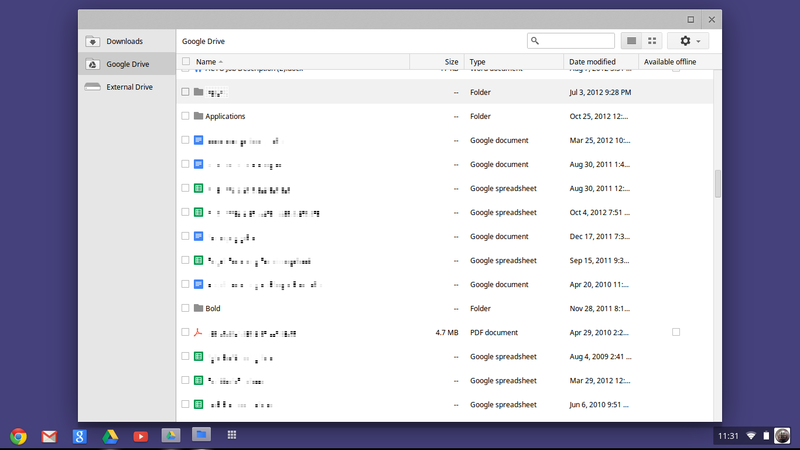 Folders are just intermingled with files. 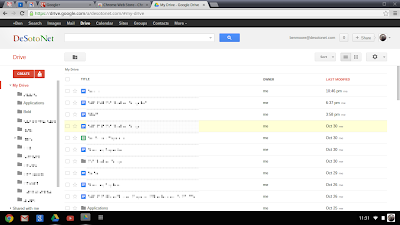 Just to compare, here's the web presentation of Google Drive (from the Chromebook). Ok, now to keystroke combos. I was using Google Plus and wanted to go to the top of the page. So I just needed to hit Home. Sorry, no Home key. Nothing in Help to point me to it. A Google search turned up Ctrl+Alt+Up Arrow. Give me a break! It takes 3 keystrokes to enter something as fundamental to web browsing as Home? So you want to know what the rest of the secret codes are? Good luck. Try Ctrl+Alt+/. I'm not kidding. That's the documentation. Just poke around and discover what does what. Unacceptable. I'm not sure about the Chromebook. One of the TLAs I mentioned previously was NFC (Near Field Communication). There's been a lot of "noise" about NFC and using this feature for mobile payments. That gets complicated real fast because everybody wants their cut of the transaction. 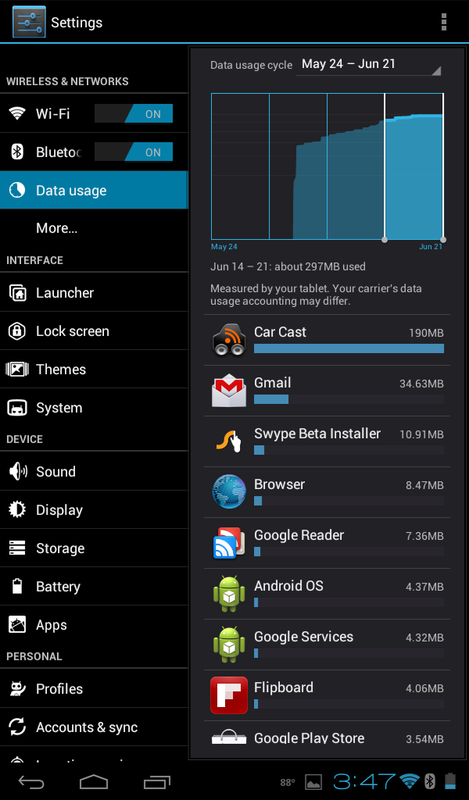 Google has implemented Google Wallet on the Nexus devices but initially this would only support MasterCards. This has been addressed and now supports more credit/debit cards. Several of the wireless carriers, e.g. 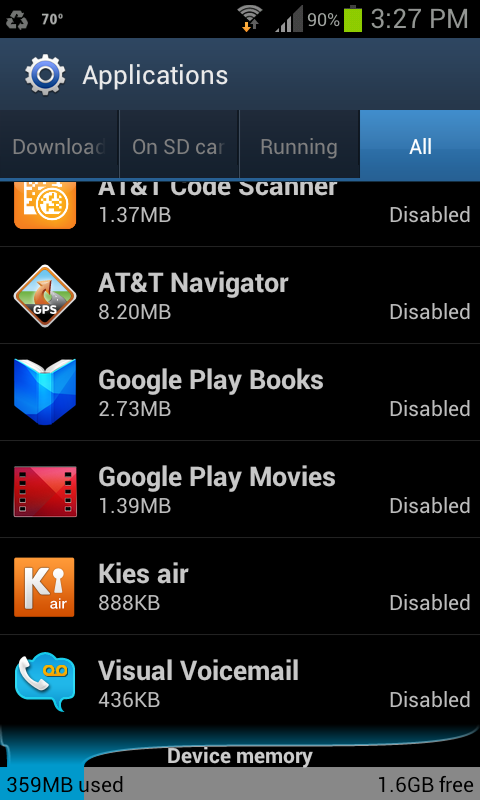 AT&T, Verizon, and T-Mobile, have blocked Google Wallet on their devices and are promoting their own ISIS service. ISIS uses a special SIM card for authentication. Using NFC for mobile payments with Google Wallet requires a "secure element" which isn't necessarily part of NFC. What this means is twofold: 1) some phones don't have a a "secure element" (e.g. 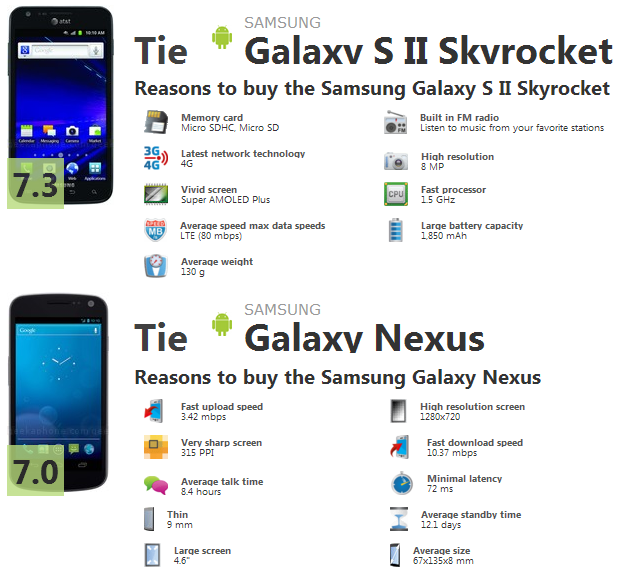 my Samsung Galaxy S II Skyrocket) so seemingly those devices will never support mobile payments with Google Wallet, and 2) that NFC can be used for other functions. The rest of this post will focus on the second point. Steve Gibson did an entire episode of Security Now on NFC. In this discussion Steve explains why NFC is limited to a 1 inch range. You don't have to literally "bump" the devices but they've got to be really close and remain so for the duration of the exchange. Let that soak in - 106Kbps. That's SLOW. Notice the lowercase "b" indicating bits. And the devices have to be maintained in the 1 inch range during the entire transmission. So how do you overcome that? So there are are currently three implementations of NFC transfer. 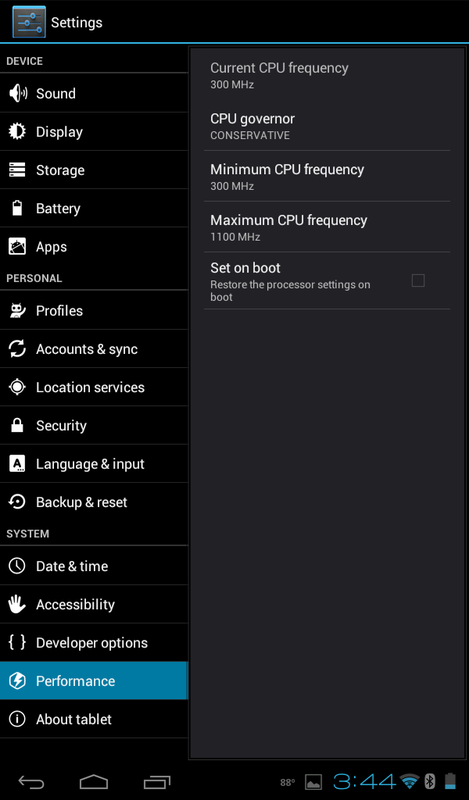 First Android Ice Cream Sandwich has a capability called "Android Beam." Here's a good description of how it works. 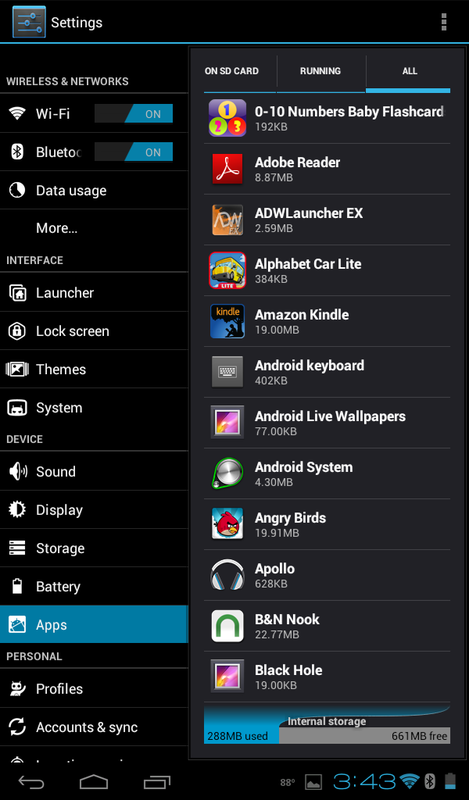 Basically ICS simply uses the NFC bandwidth to exchange data between two devices. Consequently the objects must be small, e.g. a concise URL such as a Google Map or Google Play Store location (and I'll bet it uses the goo.gl shortener). I have actually used this capability. A co-worker and I held our Samsung Galaxy S IIs back to back. On mine I had Google Maps as the current application. His was on the home screen. When the NFC chips established contact both phones vibrated. Then the display on mine changed to what looked like a webOS "card." Above this card were the words "Touch to beam." When I tapped on the card, it disappeared into the distance and the Google Map presented on his phone. I didn't see any residual evidence of the transfer. So what applications support this Android Beam? Dunno. I've looked high and low for a list with no success. Google Maps worked by my own testing. Sending URLs between Chrome browsers didn't for me but allegedly they should. Reports say that contacts should transfer. There's also a related use of this capability known as "NFC Tags." These are passive stickers that transmit an NFC signal when energized by the NFC radio in a device. These tags can transfer the same type of data that is exchanged between two devices. 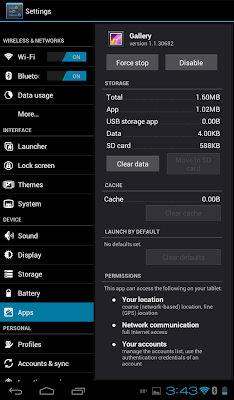 This means that the tags can trigger pre-defined actions on the device, e.g. 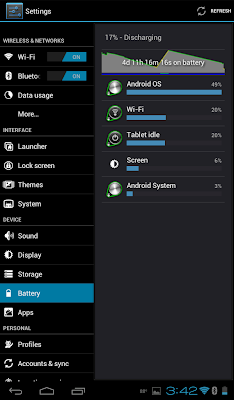 turning Wi-Fi on or off, performing a Foursquare check-in, etc. There's a good article on NFC tags here. 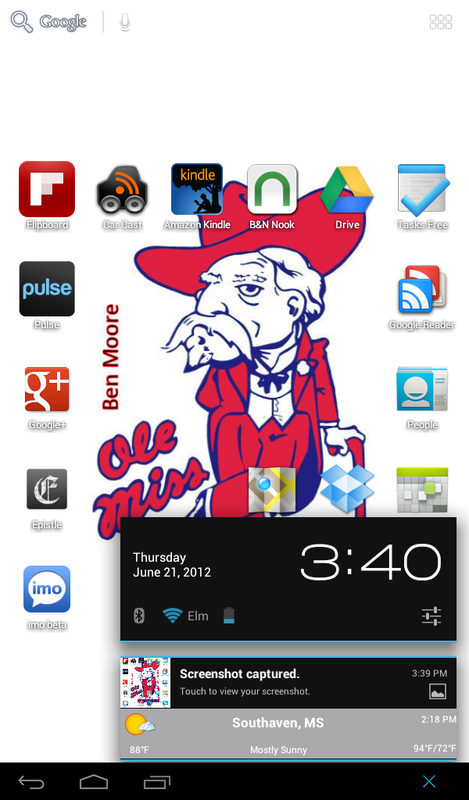 Second Samsung has a like capability on Samsung Galaxy S IIIs called "S Beam." Here's a good description of how it works. 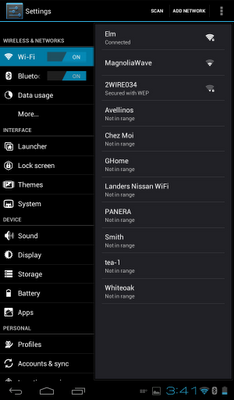 NFC is used to identify the devices but the actual object is moved over Wi-Fi Direct. This raises the bandwidth to 300MBps and relieves the need to maintain the 1 inch proximity during the transfer. Notice the uppercase "B" indicating bytes. You can see S Beam work here in Samsung's Galaxy S III commercial. 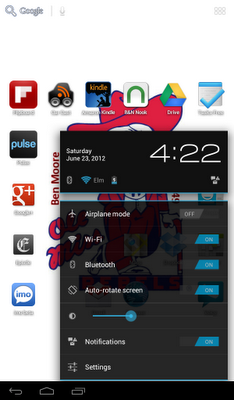 Lastly Android Jelly Bean extends the "Android Beam" capability to use Bluetooth as a transfer medium. Here's a good description of how it works. In this method the bandwidth varies with the version of Bluetooth the devices support and like S Beam the requirement for the 1 inch proximity during the transfer is relieved. So what devices have NFC? There's a good list of NFC devices here. Oh, the iPhone 5 doesn't have NFC. Maybe next time. I apologize for how confusing this is but I haven't found even this level of comparison of the various NFC implementations anywhere else. If you find more detail, please post a comment. Speaking of apps on my Skyrocket, here's what I'm using now. Speaking of apps, there's a nice new feature of ICS that I've been using. I never rooted my Captivate so I couldn't get rid of all the carrier loaded apps. 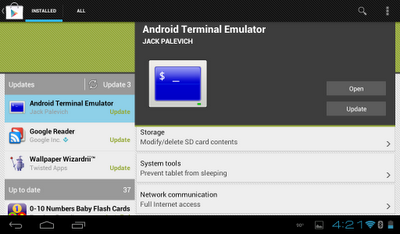 They kept getting updated in the Google Play Store so I kept getting notifications that I had updates to apply. It finally got to where there were 11 apps offered to update that I didn't want to update. With Ice Cream Sandwich there's a Disable choice in Settings / Applications / All that will let you Disable an app. 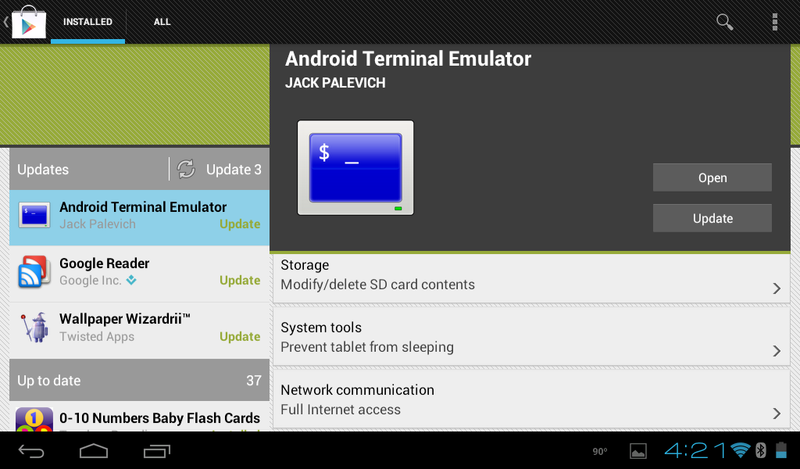 That doesn't uninstall it but does stop the nagging by the Google Play Store. 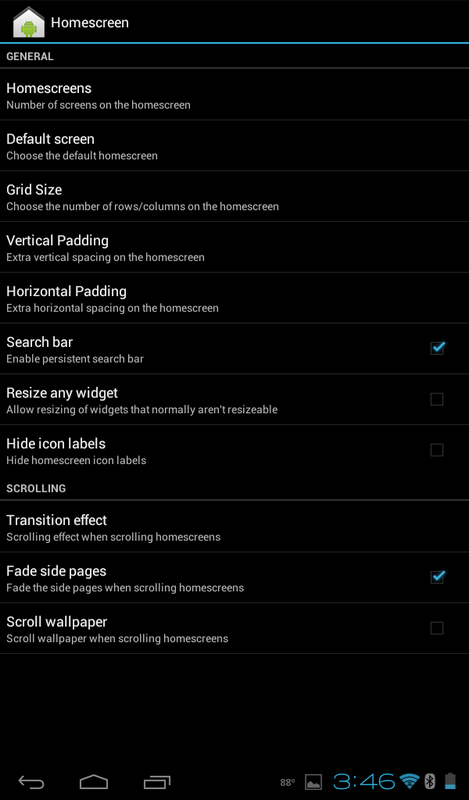 This setting doesn't seem to "stick" on Google apps. They keep coming back. 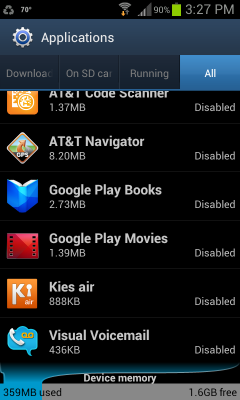 If you want to restore one of these apps, they're just at the bottom of the Applications list. As I mentioned in my TLA post, AT&T just lit up their LTE ("Long Term Evolution") network in the Memphis metropolitan area. 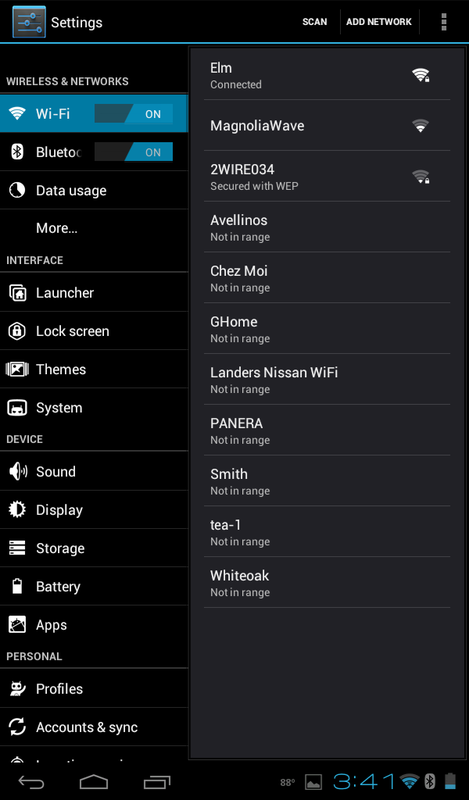 All the carriers call their LTE network "4G" but it really isn't 4G. Nevertheless it's FAST, for now. Time will tell how the various carriers' LTE networks stand up to the the onslaught of millions of iPhone 5s in the next couple of weeks. What I can tell you is right now it's smokin'! Here's a screenshot from speedtest.net on my Skyrocket near my house. Yeah. You're reading that right. 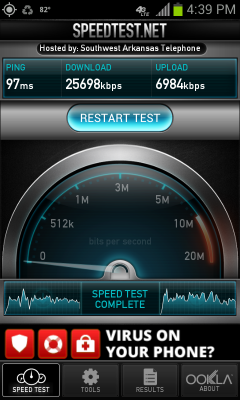 That's showing more than 25Mbps down and almost 7Mbps up. It just can't stay that fast. Think of the backhaul capacity the carriers would have to have. They'd have to have fiber to each tower. But I'll enjoy it while it lasts. Yeah, yeah. 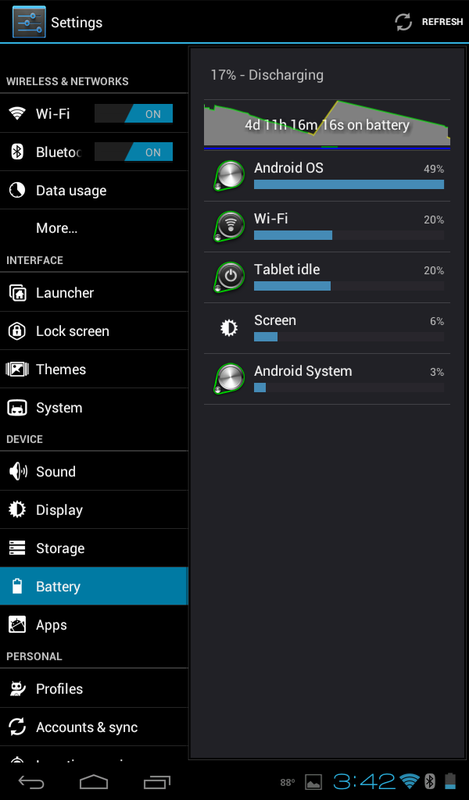 I know I've blogged about Ice Cream Sandwich (ICS) before. But that was on my Nook Color. 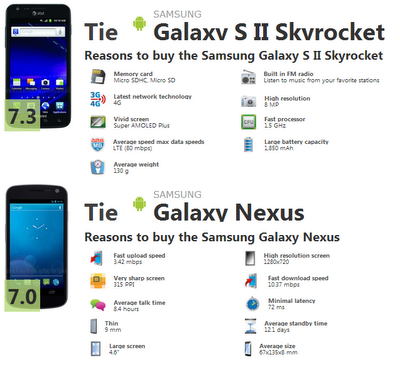 This is about Ice Cream Sandwich on my Samsung Galaxy S II Skyrocket (isn't that a mouthful?). The Skyrocket came with Gingerbread. 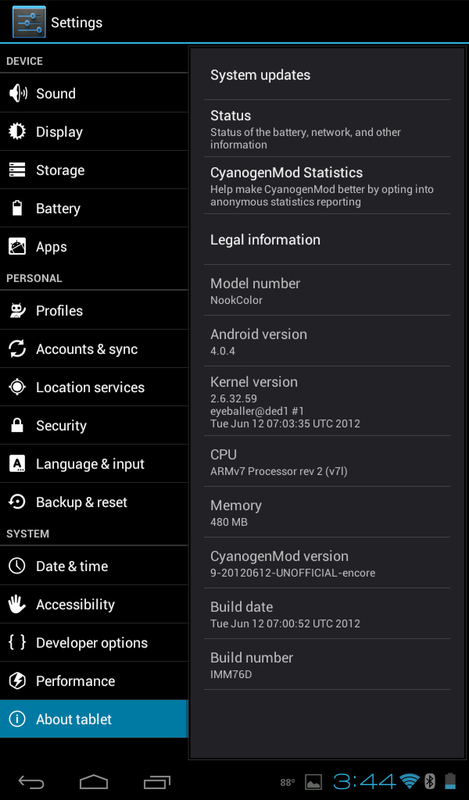 ICS for the Skyrocket has been out since July 2012 so my plans were to immediately upgrade to ICS. I had prepared for this by studying Samsung's guide. This is a really thorough step-by-step guide. When I was buying the Skyrocket I mentioned to the sales person (who was excellent by the way) that I was planning to upgrade as soon as I got home. She cautioned me and said they had replaced several Skyrockets that people had tried to upgrade. "At least do it in the first 30 days so we can do a store exchange for you." was her advice! Not very reassuring. By the way, the sales person exchanged my Captivate's SIM card for an "LTE" SIM card. She did the activation so my number was live on the new SIM when I left the store. She did offer me a number to call to speak to a Samsung expert at AT&T regarding the upgrade. Turned out that was just the normal AT&T customer support but they did have a representative that was knowledgeable on the upgrade. Her advice was to make sure that the SIM card was removed before starting the process. If the phone rings in the middle of the process the phone could be bricked. 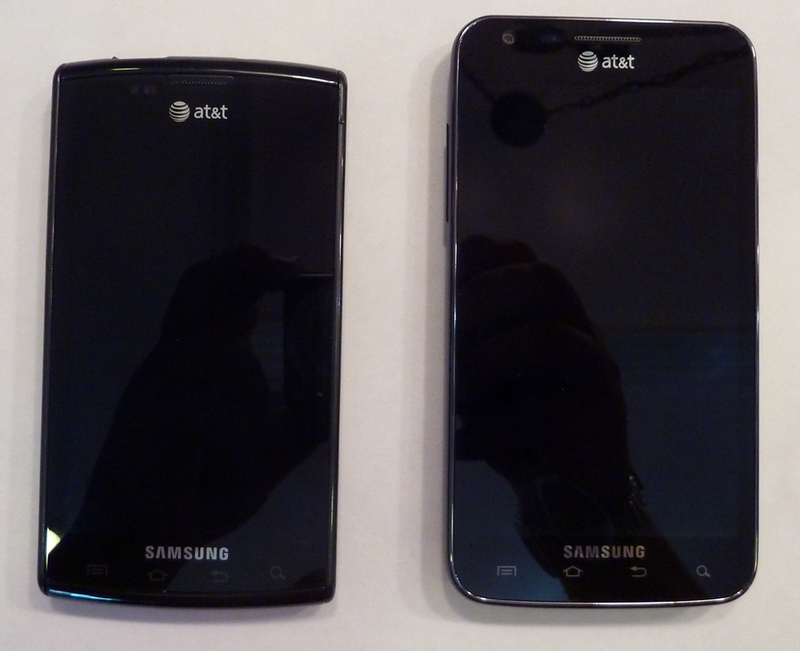 As I had taken the new SIM card out of the phone at the AT&T store I was ready. She stayed on the phone with me until the new image was downloading. We agreed on a time that she would call me back and I sat and watched. The laptop I used was the same one that I had used to flash Gingerbread on my Captivate. 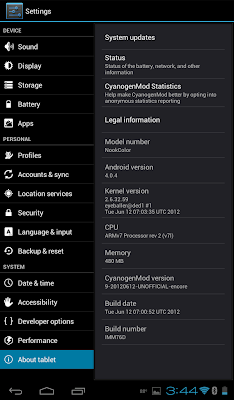 That process used Kies Lite and the ICS process called for the full Kies. As the process proceeded I got a message from Windows 7 (32-bit by the way) that a driver had failed to install. Then the upgrade process stopped and eventually got a "timed out" message. The message told me to where to restart the process. This time it went perfect. Overall it probably took less than an hour. The image had to re-download which was the biggest time. The AT&T customer service representative did actually call me back! 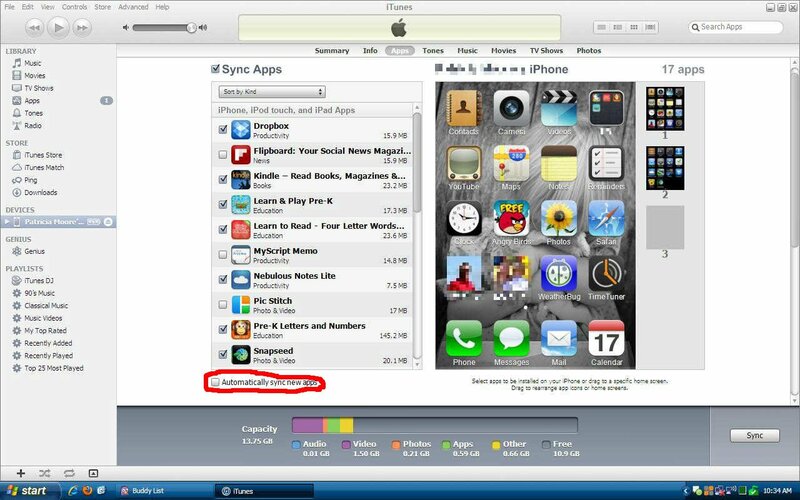 By that time I was installing apps on the Skyrocket. A couple of times my daughter has had audio recordings she has made on her iPhone that she wants to post on her Blogger blog. Blogger doesn't support audio so I had to look around some. Unfortunately there is no easy solution. I've found a way but it almost takes standing on your head. Let's start with the easy part. If your audio is from an iPhone it will be a .m4a file. I use media.io to convert it to .mp3. Now the hard part. Do a Google search for "audio-player.swf". Start going through the links looking for a link to a audio_player.swf that you trust downloading from and that works. No need to waste your time on the Google links. It seems like they've all been moved. I found a link that worked. I downloaded the file and renamed it to just audio-player.swf. Sorry but it gets harder. Now you need a place to upload files to. 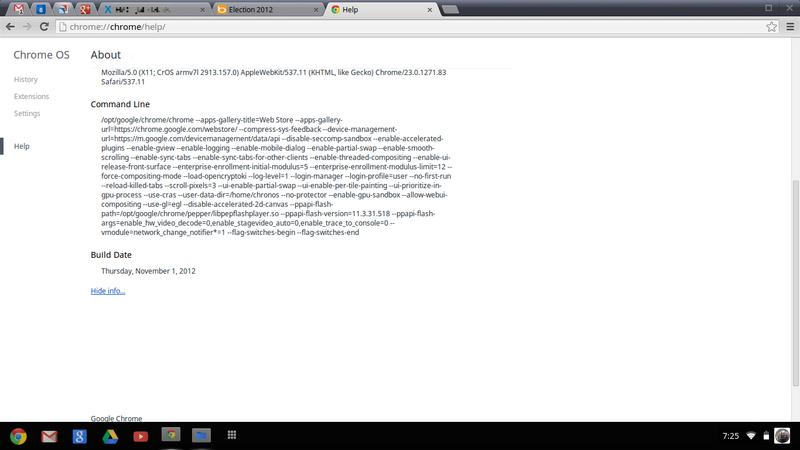 Fortunately I have access to a Google Sites site. I uploaded audio-player.swf and the mp3 file to this site. Well, that's all the hard stuff. Here's the HTML code that you'll need to embed in your Blogger blog. Sometimes you just have to shake your head at things corporations do. My daughter sent a DVD of Disney's Sleeping Beauty with our granddaughter. When she asked for it I popped it in the DVD player. In a few seconds a screen popped up offering "Fast Play" or "Main Menu." You know how impatient I am (and a 3 year-old is even more impatient) so I thankfully chose "Fast Play." "Fast Play" is the slow way to watch a DVD. If you chose "Fast Play" you get to see every trailer on the DVD. "Main Menu" takes you directly to a menu where you can just play the DVD. Incredible. Reminds me of why I wrote this years ago. You can read Disney's euphemistic explanation of it here. After the second consecutive week of Flash updates, I've just uninstalled Flash. I still use Chrome with its embedded, sandboxed Flash but Google has been updating it immediately. And since Chrome v21 Flash has run using Pepper Plug-In API (PPAPI). "This extension is designed specifically to ease the implementation of out-of-process plugin execution." Way over my head. And Java, here we go again. As I said before "Just uninstall Java and JavaFX. You really won't miss it." Recently I came across an article on Forbes on The Fallacy Of Remote Wiping Your Phone. First: Ensuring that an entire flash memory module has been forensically erased. Third: Remote wipe indiscriminately destroys both corporate and personal data. Fourth: There are a number of scenarios where remote wipe can be circumvented. Hmmm. Sounds like a real problem. But let's look at these in the real world. I discussed this with a former co-worker who has had firsthand experience with remote wipe. The following is a recap of that discussion. First case is FUD. 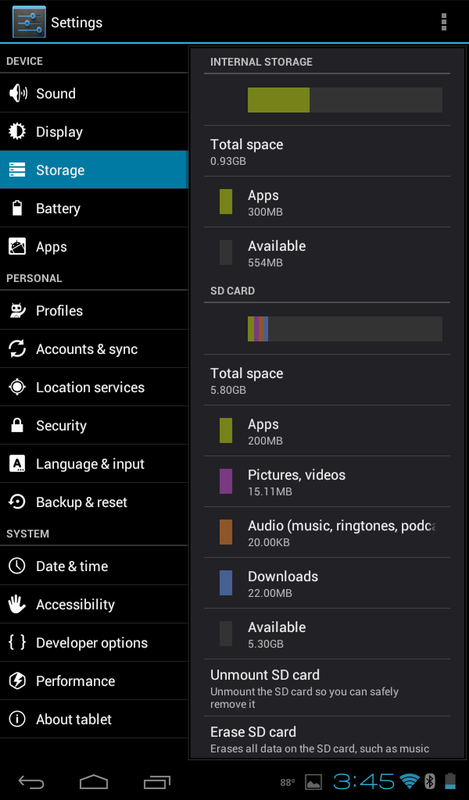 Today nobody but a three letter agency could recreate files on flash storage in a phone. A presentation at Usenix FAST 11 suggested "none of the available software techniques for sanitizing individual ﬁles (from Flash-Based Solid State Drives) were effective" but didn't offer any tools or techniques for actually retrieving files. 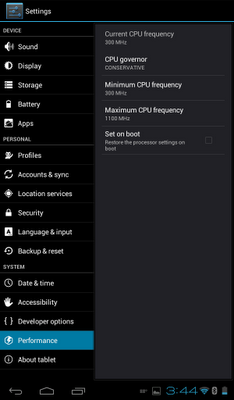 Second is a fringe scenario, at least on non-Android platforms. Most people just don't do that. Look around at your friends. How many of them have rooted or jailbroken their phone? Ok, maybe not your friends but look around the office then. Third can be addressed with policy before you allow a connection. 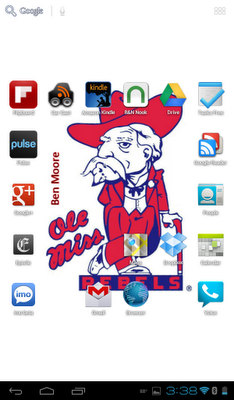 Agreeing to that risk should be a part of the agreement of BYOD. Fourth is a legitimate concern. My favorite scenario is for the miscreant to simply remove the SIM to avoid the remote wipe. 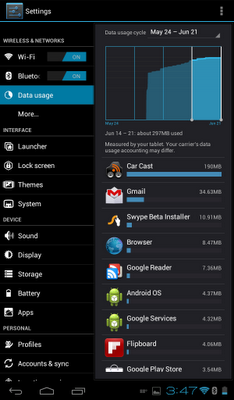 Only allow mobile devices that have an application that can be used to remotely wipe data and lock them. The IT department should maintain this list and be responsive in updating it. Only allow users that have written approval from their management to connect mobile devices to the corporate network. Periodically review this need. 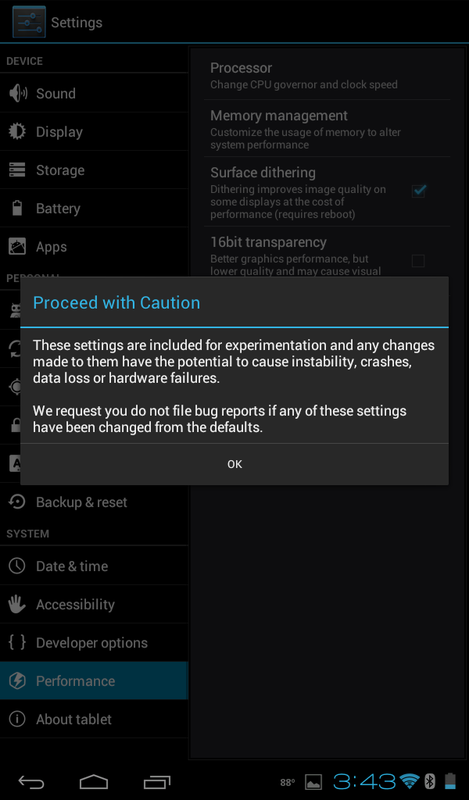 Devices that have been modified or updated to allow security to be bypassed are disallowed. These are commonly known as "rooted" or "jailbroken." Disallow storing sensitive corporate data on removable media unless encrypted. Some of these will have to be enforced with spot audits along with recurring policy sign-offs based on the business risk. I need to open this with making sure that you know that I haven't touched the Windows 8 RTM bits. And that my experience with Windows 8 was with the Consumer Preview in a virtual machine. However I have been following others' experience with the gold bits for Windows 8. Most of the reviews take one side of the other. However a couple of recent articles seem to take the middle road. First I came across an article in Computerworld. The author contrasts the Metro Modern UI with iPad and Android. Designed from the ground up to display information, it provides a significantly different experience from using an iPad or Android tablet -- information-centric rather than app-centric. I think that this is a positive real differentiation for the Modern UI on all platforms. 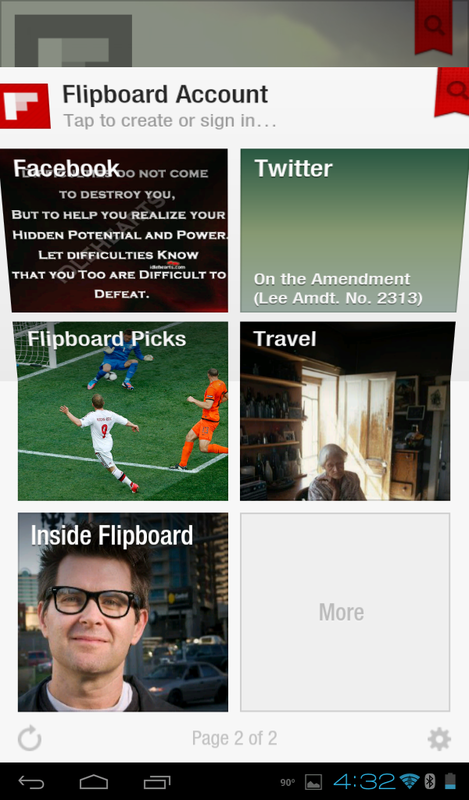 The article goes on to talk about the Modern UI apps. But others, such as Mail, remain underpowered compared to traditional desktop apps like Outlook. I don't think that this is an issue as the Windows Live Mail app for Windows 7 is also "underpowered" when compared to Outlook. Power users are going to want to add their preferred app. Microsoft really needs to get the Modern UI apps out there before buyers start taking their new Windows 8 PCs/tablets home. Windows 8 falls short on tablets only when you want to get to the Desktop, but considering that tablets are generally used to consume content rather than create content, you likely won't need to go there. I'm not sure that I agree with the assumption that "tablets are generally used to consume content rather than create content." I see imaging apps like Pic Stitch and presentation apps like Haiku Deck emerging as solid content creation tools leveraging the capabilities of a tablet to facilitate creation of dramatic content. 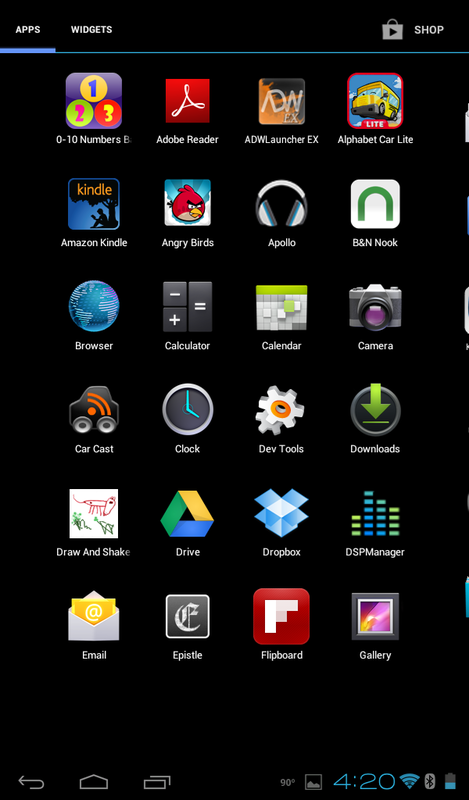 I think that as tablets mature the idea that they are only consumption devices will quickly disappear. This goes back to the aforementioned concern over "underpowered" Modern UI apps. Again, Microsoft's challenge is to hit home runs with Modern UI apps, not just pretty faces on Desktop UI apps. Obviously pretty faces on Desktop UI apps won't work at all on Windows RT tablets. The second article I came across was from Lockergnome. Even Paul Thurrot expressed hope that Microsoft would have some kind of tutorial on the Modern UI for new users. It seems that this is in the RTM bits. ...during installation, there’s now an animation explaining the presence of hot corners in Windows 8. It’s a very clear and straightforward visual, but still many people will wonder what it means. The author had a good experience installing Windows 8 on a three year-old laptop. I'm not sure that that is germane as most people will buy Windows 8 pre-installed. These articles focused almost exclusively on the Windows 8 presentation perspective. But there's lots more to Windows 8 than just the presentation changes. Some of the underlying changes are real leaps forward ahead of the competition. 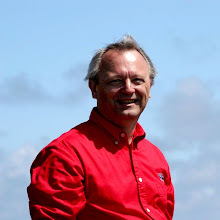 For example, according to Paul Thurott Windows 8 "will automatically sync virtually all possible settings for you." Let that soak in for a minute. 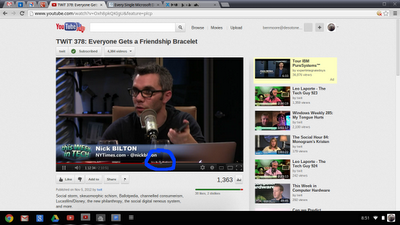 Google Chrome browser users will appreciate this since Chrome does that across browser instances. But Chrome is limited to just browser settings. 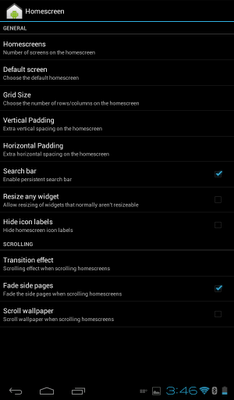 Think about this capability for all PC/tablet settings. Apple's iCloud doesn't even come close to this. It's going to be an interesting Fall! The Technology Formerly Known as "Metro"
Ever since Windows Phone 7 introduced the new sliding tile user interface it has been known as "Metro." Subsequently it has appeared on XBOX and Windows 8. Out of the blue Microsoft has rejected the "Metro" brand. Just a couple of the articles covering this are from Microsoft Watch and Computeworld. Here are some screenshots of microsoft.com references to Metro. "We have used Metro style as a code name during the product development cycle across many of our product lines," a spokeswoman said in an emailed statement. "As we get closer to launch and transition from industry dialog to a broad consumer dialog we will use our commercial names." And that is: Windows 8 Style? Let's talk elegance. Really, that's what sells Apple. Apparently Microsoft doesn't get it yet. 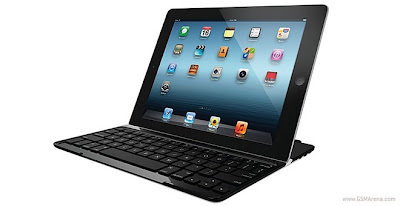 Here's Logitech's Ultrathin Keyboard Cover. Count the parts. I'll help. ONE. Try to find the batteries. They are built-in and charge off an ubiquitous microUSB cable. 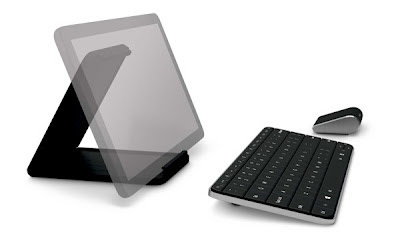 Now here's Microsoft's Wedge Mobile Keyboard. Count the parts. THREE. Batteries? You better go buy a bunch of AAs and AAAs. Yes. The keyboard and mouse take DIFFERENT types of batteries. The keyboard stores in the case so you'll have to keep up with your Microsoft Surface and the keyboard in its case. The mouse? I guess you'll have to put that in your pocket with your extra batteries. Hey, but the keyboard has Charms keys! Incredible how Microsoft just doesn't get it.